Costume designer Mark Bridges and Helen Mirren rode on a Jet Ski that Bridges won for delivering the shortest Oscar acceptance speech at the ceremony. LOS ANGELES -- Oscars host Jimmy Kimmel gave away an $18,000 Jet Ski as a grand prize to the person who delivered the shortest acceptance speech during the ceremony. During his opening monologue the late night host had actress Helen Mirren showcase the expensive water craft in the back of the stage. "Why waste precious time thanking your mom when you could be taking your mom for the ride of her life on a Jet Ski?" Kimmel said. 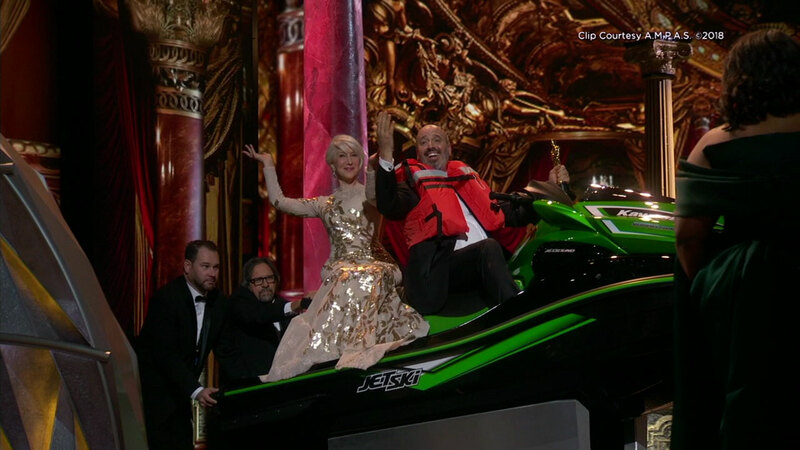 Actress Helen Mirren presents a jet ski to the Oscars audience as Jimmy Kimmel offers it as a grand prize to the person who delivers the shortest acceptance speech. He added that if there is a tie at the end of the night, the water vehicle would go to Christopher Plummer, alluding to Plummer replacing embattled actor Kevin Spacey in "All the Money in the World" mid-production. The first award of best supporting actor was given to Sam Rockwell, who quickly joked that he wanted to win the Jet Ski and tried to make his speech short. The winners for best original song, Kristen Anderson-Lopez and Robert Lopez, joked that they wanted to win the vehicle, but they were from Brooklyn and went on with their speech. In the end, after all the winners were announced and the cast and crew of "The Shape of Water" celebrated their big win on stage - Kimmel announced the winner. Out came the costume designer for "Phantom Thread," Mark Bridges, and Helen Mirren riding on the Jet Ski. Bridges donned a life vest as he rode onto the stage.